As I am wont to do, I thought I’d look at one of the claims about fracking in wells in Oklahoma. Why Oklahoma? I’ve heard quite a few people who are alarmed about all the quakes in Oklahoma since fracking came on line. So, why not take a look at some basic information? That looks pretty, bad, I have to admit. Especially when we all think of Oklahoma as a place that doesn’t HAVE quakes! And this map makes it even look worse, doesn’t it? At least on first glance (also not showing the Panhandle). Look at all those fracked wells! All of that LOOKS like an indictment of fracking. But let’s at least go through the motions and see how bad it is… Let’s gather some information and do some comparing, okay? We need to identify the basic information first, and see what happens. When did fracking in Oklahama begin? Has fracking increased in recent years? Where are the fracking wells? Is there a pattern to the fracking well locations? Where are the quakes in Oklahoma in recent years? How many quakes have there been? How strong are the earthquakes? Is there a pattern to the quake locations? Is there a tie-in between the fracking well areas and the quake areas? For comparison, do neighboring regions show any fracking-quake patterns? 1. When did fracking in OklahOma begin? The American Oil & Gas Historical Society has a web page, Shooters – A “Fracking” History. It tells us that fracking is not a new invention. Civil War veteran Col. Edward A.L. Roberts’… revolutionary oilfield invention will greatly increase production of America’s early petroleum industry. Roberts received the first of his many patents for an “Improvement in Exploding Torpedoes in Artesian Wells” on April 25, 1865. Roberts was awarded U.S. Patent (No. 59,936) in November 1866 for what would become known as the Roberts Torpedo. The new technology would revolutionize the young oil and natural gas industry by vastly increasing production from individual wells. Does all that surprise you? It surprises me – big time! I thought that fracking was NEW! The early technique was called “shooting wells”. Improvements came along in 1939 and 1949. In that latter year the first oil well, outside Duncan, Oklahoma, had the first application of what we now call oil well fracking, while on the very same day it was also used on an oil well near Holliday, Texas. That was 2 years after the first gas well had been fracked. 2. Has fracking increased in recent years? Since… 1949, hydraulic fracturing has done more to increase recoverable reserves than any other technique, and Halliburton has led the industry in developing and applying fracturing technology. In the more than 60 years following those first treatments, more than two million fracturing treatments have been pumped with no documented case of any treatment polluting an aquifer – not one. A million fracked wells before 1988? Holy crap! Apparently, before 1988 (39 years) one million times wells in the world had been fracked – about 25,000 per year. In the 27 years since 1988 an equal number of times wells have been fracked, at a rate of about 37,000 per year, so fracking of wells has increased overall by about 48% since 1988. 3. Where are the fracking wells? Besides the panhandle, the state has fracking wells in the western 3/4 of the main part of the state – but not evenly disributed. The wells are clustered, with the NW and SW corners (west of Lawton) having very few. 4. Is there a pattern to the fracking well locations? The fracking wells map above shows that the regions with fracking wells is mainly north-central, plus a swath running from south-central to west-central, and plus a smaller pocket just north of Tulsa. 5. Where are the quakes in Oklahoma in recent years? Mainly the quakes history for the late period of fracking (post-1980) are in a swath running SSE-NNW across the center of the main part of the state – and pretty much only the northern half of the state. 6. How many quakes have there been? For the 34 years and 7 months from January 1980 to early August 2015, I searched the USGS database for all quakes of 3.0 and above. With NO quakes in the Panhandle, the search included only the main part of Oklahoma. The search turned up 1410 quakes that were in the state of Oklahoma. Of those, I counted only 53 of the ~1400 south of Oklahoma City’s latitude. The main part of Oklahoma measures about 300 miles x 215 – 64,500 square miles. This amounts to about 0.022 quakes per square mile per 35 years. 7. How strong are the earthquakes? Of the 1410 quakes, exactly ONE was above 4.9. FIVE were 4.5 and above. 12 were 4.2-4.4. 20 were 4.0 or 4.1. 196 were 39 to 3.5. The rest, from 3.4 to 3.0, number 1,176. If you know anything about earthquakes, the first thing you learned was that all earthquakes are not equal. Some are powerful and some are not, energy-wise. Each 1.0 increase is TEN times stronger. A 4.0 is 10 times as strong as a 3.0. So it takes TEN 3.0 quakes to equal ONE 4.0. The 1,176 ones between 3.0 and 3.3 average about 3.1, so they equal about about 1004.0 quakes. Recall that this is in 35 years. 8. IS there a pattern to the quake locations? Yes, in Oklahoma there are two main regions of quakes. One main region is bounded on the SW by Oklahoma City and NNE just past Stillwater, and bounded by Enid on the NW. The other main region is NNW of that one, up to the state line, and mostly in Alfalfa and Grant counties, along with the northernmost area of Garfield county. The southern half of the state – south of Oklahoma City – has various quakes spread out sporadically. Virtually none were east of Tulsa’s longitude, and none within 35 miles of Tulsa itself. Only about 10 scattered quakes show up in the main part of the state SW of Enid. Literally none have occurred in the Panhandle. 9. Is there a tie-in between the fracking well areas and the quake areas? let’s look at the two maps side by side. They are both in the same image here. On the left is the USGS quake data map for Oklahoma since Jan 1, 1980. On the right is the map of fracking wells in Oklahoma. This 35 year period is actually 8 years longer than the 1988 date, so MORE than 1,000,000 applications of fracking to wells in the world have been done since 1980, and one has to suspect that – Oklahoma being the home of fracking, that more than half the application of fracking to Oklahoma wells has been done, too, since 1980. This is an assumption, but a reasonable one, IMHO. Yellow circles on the left map are quakes this week. 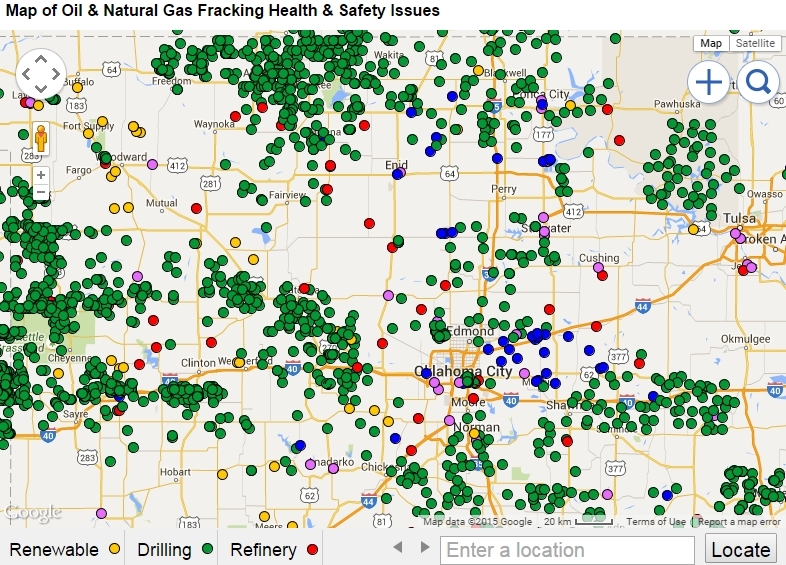 Green circles on the right map are fracked wells. Please be aware of the note at the top, saying that the two maps are essentially the same scale. A close examination shows that the west-central part of the state has a lot of fracking wells – but almost zero quakes for 35 years. Likewise, west of Oklahoma City are a considerable number of fracked wells – and again, no quakes to speak of. North of Tulsa is a gaggle of fracked wells – and no quakes there, either. 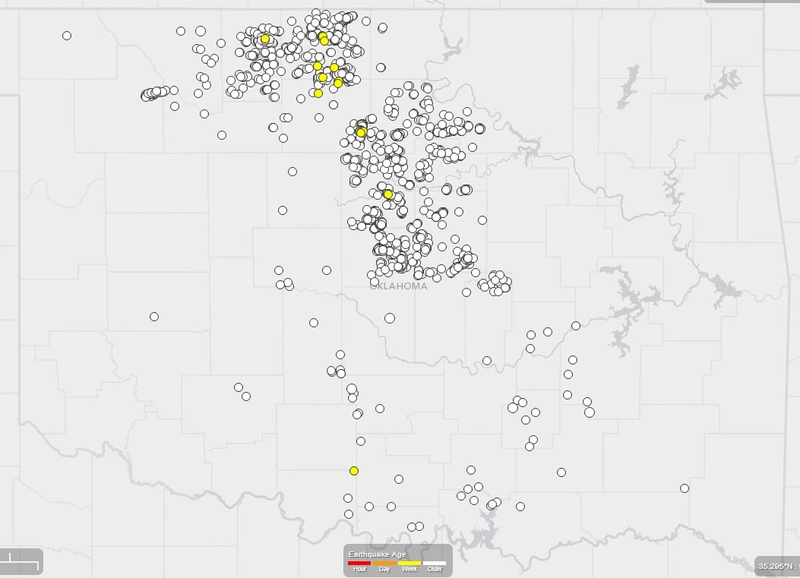 hose fracked wells in southern Oklahoma are in a region with very few quakes, as well. The ONLY region that has a sizable number of fracked wells AND a sizable number of quakes is that north-central region, in and around Alfalfa and Grant counties. Most of the regions do not support a connection. This is not opinion. This is fact, shown clearly in those two maps, side by side. Aided by my added red notes, this shows me (at least me) that any fracking-quake assertions are NOT based in reality. There is no correlation to speak of. 10. For comparison, do neighboring regions show any fracking-quake patterns? I was shocked by how FEW quakes there have been in the 35 year period, 1980-2015. How many? 40. Only 3 quakes over 3.9. In 35 years. The quake rate is 0.00085 quakes per square mile per 35 years. This is 1/25th the “quake density” of Oklahoma. 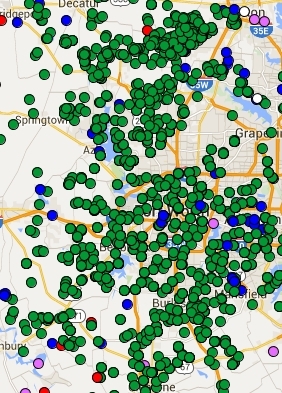 Let’s try another heavily fracked area, in and around Fort Worth, Texas. The area is about 60 miles x 45 – 2700 square miles. This area had 15 quakes in 35 years, the highest one a 4.0. The area comprises about 2700 square miles, or 0.0055 quakes per square mile – per 35 years. That is 1/4 the “quake density” of Oklahoma. The comparisons for quake density took ALL of the main part of Oklahoma into those numbers. Had only the general regions with fracked wells (the western 3/4) and/or only quake areas been taken into account, the ratios would have been a good bit higher. If there was a geographic correlation, then it could have been very possible for there to be a cause-and-effect relationship between the fracked wells and the quakes in Oklahoma. On the other hand, if a geographic correlation was NOT found, then no such cause-and-effect relationship can POSSIBLY exist between fracked wells and earthquakes in Oklahoma. Is there some fudge room here? Is there maybe SOME correlation, by which some of the claims might somehow be possible? No. There is no gray area here. Only ONE area of quakes overlaps with an area of fracked wells – in the two-county area in the north. Countering that ONE are ALL the other areas that do not have any geographic correlation. The southwest of the state, with many fracked wells has almost no quakes. The area north of Tulsa is quite dense with fracked wells, and yet there are ZERO quakes in that area. The area east of Oklahoma City has about 70 fracked wells, but only the very westernmost 8 or so of these overlap with any quakes. The area directly east of the north-central area of quake-fracked-well overlap has plenty of fracked wells – and NO quakes to speak of. If any conclusion can be made of this it is that there IS no geographic correlation between fracked wells and earthquakes. And, as I said, if no geographic correlation is shown – and that IS the case – then a cause-and-effect relationship between the two is logically inconsistent with the facts – and therefore does not exist. Add in the much lower “quake densities” compared to highly fracked areas (which should, according to the hypothesis, have at least as high of “quake densities” as Oklahoma), and the hypothesis gets even weaker – 75%-96% weaker. This hypothesis that so many people accept uncritically is simply WRONG – if Oklahoma is to be considered a s a test case, which the above does. This entry was posted in Alarmism, Fracking, Fracking quakes?, The World is Getting Better Not Worse and tagged Fracking, Fracking Quakes?, Oklahoma. Bookmark the permalink. Velly interesting!! As a thought: Are there any reasonably active fault zones in the quake prone areas of Oklahoma? This would probably account for more of the quakes than fracking. I too was amazed of the age of the fracking practice. What’s old is now new! Sorry I didn’t reply to your question before. Somehow I didn’t see this comment of yours until now. Yes, there are active fault lines in Oklahoma. But they tend to produce weak quakes, and normally not many of them. Thus, the recent spate of quakes (weak ones, still) IS reason for people to ask questions. They have jumped to the conclusion that since the upsurge in them coincides with what they think is a new process that includes underground explosions, that the upsurge is connected with the new process. But since many hundreds of thousands of wells have been fracked in the past (since the late 1860s), their belief that the process is new isn’t correct. There is no reason why the recent fracking should cause a lot of quakes when the history even only 10 or 20 years ago didn’t cause a lot of them. The conclusion I draw is that something else is causing the increase – and there is no logical reason to believe that the cause is not natural. If it is not fracking – and it appears not – then natural is the next suspect on the list. It seems that some people assume that all things industry does are harmful, so they are ripe for suggestions that quakes are caused by industry. That is okay, as long as it is just someone thinking it. But when it comes down to being TRUE, well, that needs some evidence. And evidence is subject to scrutiny. And the internet has at least SOME information out there, with which to discern the real facts. It took me much longer to write this blog post (4 hours) than it did to find the evidence (20 minutes). Everyone who is online could have found out what I found out. That’s all it takes – 20 minutes. Great study. However those who believe that fracking causes earthquakes will be undeterred in their mindless unscientific criticism of the process Thanks for taking the time to perform a cogent study. I originally had no strong viewpoint as to relationship between fracking and earthquakes. Thanks for giving me a website to refer my liberal friends. Yeah, I’ve got no horse in this race – no agenda to push. I have no love for the oil industry, and if they ARE creating problems, I agree that they should be held to account or to stop. Surprisingly, this geographic and quake data inquiry suggests that the industry may not be causing this problem. And if the quakes are not from the fracking, then the quakes are not a problem that can be solved. We have never stopped natural quakes anywhere else, so there is not reason t think we will would be able to do it in OK, either. Fortunately, the energy released in these <4.0 quakes is nothing to worry about, anyway. They pose no risk to humans, buildings, or animals. …I used to work in R&D, designing ways of testing ideas and then actually running the tests, and I learned a bit about how to look for pertinent evidence and check out what is and what ISN'T causing problems. I suggest you also read the other fracking post I have done more recently. That one was even more unexpected than the evidence behind the post here. I had no idea one way or the other. So, I did what I usually do in such cases – I simply sat back to see what might pop up on the internet. I wasn’t expecting a journal paper talking about “surface activities”. That is a good development, because surface activities are things like leaks at the surface what can be addressed pretty directly, once the culprits (leaks, improper procedures, etc.) are identified.